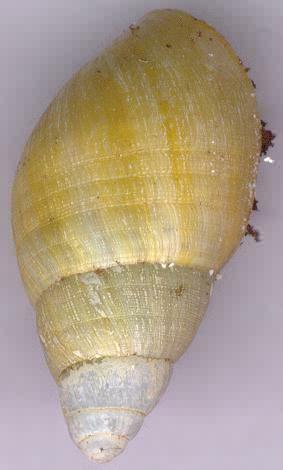 Achatina iredalei are relatively not big snails. They can rise up 7-10 cm. Their shell is gaunt and lemon yellow. Achatina iredalei’s internal organs can be partially seen through their thin and semi-transparent shells. Their body is white. Acahtina iredalei are very delicate and tender snails. The interesting thing about them is that they are viviparous. 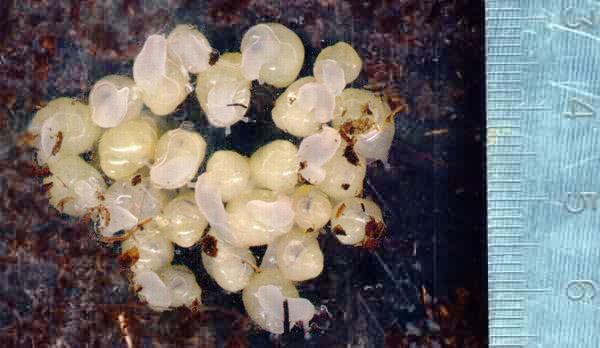 These snails don’t lay eggs. Young snails draw the first breath as entirely formed snails. There are just borned Achatina iredalei snails in the photo. An adult snail has come to the surface throug the dark hole on the right. This photo was made through the transparent aquarium bottom. Achatina iredalei snails. The size of this snail’s shell is 40 mm long.